Summary: This article was originally published in the Summer 2006 National Board BULLETIN. Each spring, the National Board receives inquiries from concerned boiler owners and operators about the best method to lay up a heating boiler for the summer. The primary purpose of laying up a boiler is to extend its life. A boiler should be shut down when not required to provide heat. We “lay up” the boiler to prevent further corrosion on both the waterside and fireside, which enhances longevity. A secondary purpose of laying up a boiler — and an economic savings opportunity — is to perform an inspection of its condition during shutdown. This aids in evaluating the water treatment requirements on the waterside and the combustion efficiency on the fireside. The recommended method of boiler lay-up is dictated by a boiler’s type and size, and by economic and safety-oriented advantages achieved performing the lay-up. There are different types of lay-up to be aware of. This article focuses on dry lay-up and wet lay-up. Some factors in the selection of lay-up include length of shutdown time, size and type of boiler, and the amount of effort to refill and monitor the boiler with treated water. Before beginning lay-up and cleaning of a boiler, be sure the combustion system is performing efficiently. This will minimize creation of soot in a clean boiler when started in the fall. Dry lay-up should be used when the boiler will be shut down for an extended period or when there is no urgency to restart (as with a standby boiler). This method also works in areas where the idle boiler may be exposed to subfreezing temperatures. Unlike the wet lay-up method, it requires a minimal amount of monitoring. Perform a bottom blow-off on the boiler before and then after shutdown to remove sediment and scale and to drop the unit’s pressure and temperature. Once the unit is at zero psi gage pressure and water temperature is under 140°F, open an air vent and boiler drain to empty the boiler. Do not use the safety valves for vents. If a vent valve is not installed, remove the plug or cap on the top crossfitting of the water column and install one on the side of a tee. This will also allow venting of air during the refilling of the boiler. When cleaning the boiler, remember that soot is easier to remove when it is warm and dry. Some technicians fire the boiler to get the water and soot warm before cleaning. The method of removing the soot on the tubes must take into account tubes using extended heating surfaces or dimpled tubes. Manufacturer’s instructions should be followed to minimize metal removal on the tubes. While cleaning the boiler’s fireside, look for rust (orange) or scale (grayish white) trails on the pressure boundary wall. Mark those areas for further evaluation of leakage. 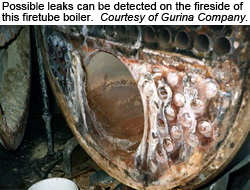 Look for soot trails on fireside gaskets to evaluate possible short-circuiting of combustion gases, corrosion of the gasket seating surface, and overheating of air-cooled surfaces. Discolored or chalky paint is an indication of possible overheating. Inspect refractory and insulation on the fireside. Small cracks in refractory are normal due to expansion and contraction, especially where openings such as observation ports pass through the refractory. With the outlet, feed, and make-up valves locked and tagged closed, and the air vent valve locked and tagged open, remove all inspection opening closures. Look for signs of gasket leakage and potential corrosion of the gasket seating surface (which could prevent a good seal). Inspect all handhole and manway yoke bolts and nuts for deterioration (which could prevent uniform tightening of the gasket). Using a battery-operated light, inspect the waterside (in accordance with all applicable confined space entry procedures) and evaluate the scale and corrosion condition. Wash down the boiler and attempt to move all scale and sediment out of the washout openings at the bottom of the boiler. 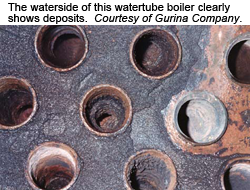 Any scale and sediment not removed will trap moisture and oxygen and corrode the boiler. Depending on ambient air temperature, a fan can be used to blow dry the waterside. Electric air heaters can be used on the fireside to warm and dry out the waterside. It is not recommended to use fuel-fired air heaters because of the potential of adding moisture or getting petroleum products on the waterside or soot on the fireside. Closely examine all surfaces showing potential leakage. Dye-penetrant examination is an inexpensive method to check leaks for potential cracking. A pressure test may be required before startup. Refer to the National Board Inspection Code, Part RB-1000 through 5000, and the National Board Web site for guidance. Make repairs using an organization meeting jurisdiction requirements. In most cases, the jurisdiction will require an R Stamp. A listing of R organizations can be found in the Manufacturer/Repair Directory. After examinations and repairs are completed, fireside surfaces can be swabbed with neutral mineral oil to prevent further corrosion. It is important to remember that the initial light-off may be a little smoky until the oil is burnt off or the boiler water is hot enough to evaporate the oil. If the ambient air is always dry, the boiler can remain open. However, if humidity and dew points get high, then the boiler should be closed. Before closing the boiler, place moisture-absorbing material such as silica gel or lime (also called unslaked lime, quick lime, calcium oxide, burnt lime, calx, and caustic lime) in the waterside and fireside. (This is not required on the fireside if it is swabbed with mineral oil.) Use a flat tray or pan to contain the material. Set it inside the boiler, and close all openings. This material should be renewed or redried every three months. The stack should also be covered to eliminate moisture accumulating near the boiler stack connection. A sign or tag should be placed on the boiler power disconnect to warn of the stack cover. A stack damper does not provide a sufficient seal from the main stack. If the main stack cannot be sealed, slip a piece of sheet metal between the boiler exhaust flange and stack flange. For smaller boilers, incandescent lights have been used to keep the boiler and/or control panel warm to prevent the collection of moisture. Electrical safety should be considered before placing light fixtures in a boiler. The steps of preparing a boiler for wet lay-up are essentially the same for dry lay-up. The exception is when a boiler is closed and prepared to be filled with water and water treatment chemicals. Perform dry lay-up steps 1-6 (except do not swab the fireside with mineral oil) and then follow with step 7 below. The alkalinity should be adjusted to greater than 400 ppm. This prevents acidic corrosion of the waterside. Tri-sodium phosphate or caustic soda has been used in the past to accomplish this (about 3 pounds/1000 gallons). Also add an oxygen-scavenging chemical, such as sodium sulfite to a concentration greater than 200 ppm (about 5 pounds/1000 gallons). Consult a water treatment company for corrosion inhibitor information. Fill the boiler to its normal operating level with water hotter than 180°F. This temperature helps drive off dissolved gases. If hot water is not available, heat the water using the boiler’s burner after the water level reaches the lowest permissible level as marked on the boiler. Vent the air and gases as needed. Since there is no feed or condensate tank to introduce the treatment chemicals on water boilers, it is recommended the chemicals be premixed with water before being placed in the boiler. Fill the boiler, allowing air to continue to vent until the water boiler is full or until the steam boiler is at its normal operating level and warm. It is strongly recommended boiler water be circulated periodically to prevent stratification of chemicals. The burner can be used to warm the water and induce natural circulation. A water boiler can use its system circulator but this will change the concentration of chemicals when diluted by system water. Monitor the chemical concentrations routinely while in lay-up. System leaks will cause make-up water to be introduced and with it more oxygen and carbon dioxide. Before starting a steam boiler in wet lay-up, perform a bottom blowoff of the boiler to reduce the alkalinity (thus minimizing the chance of carryover). For all boilers, ensure all tags and locks are removed, and witness the system cycles for a minimum of three cycles. This will help ensure proper operation of the boiler before leaving it in automatic mode.